Please contact [email protected] to order! We are delighted to share with you our Gifting Brochure. Please click the brochure below to view our offers, if there’s anything you would like but can’t see listed please contact [email protected] who can put a quote together for you. 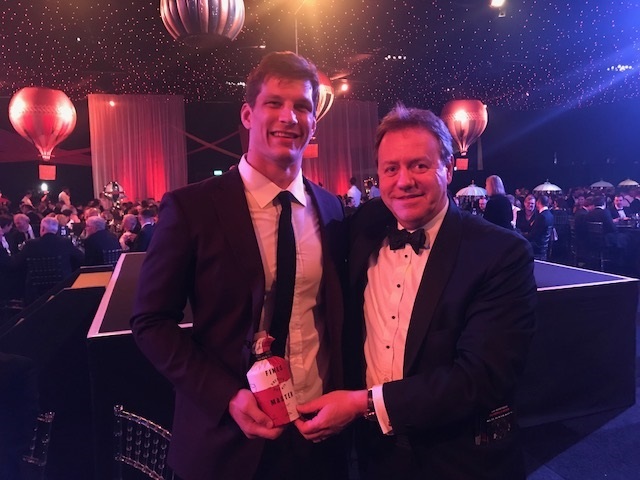 Saracens remain unbeaten this season after a narrow win at Leicester – Michael Rhodes was a key figure in this and he has now combined with Pat Cilliers and distiller Sion Edwards to make a wonderful gin called Fines Master. The former president of the Rugby Football Union and old pal of mine, Bob Reeves, indulged in a real passion by investing a few years ago in one of the premium Pouilly Fuissé regions of France and a wonderful vineyard of rare quality. See his story below. We are truly privileged to have a limited quantity available and we know you will be keen on sharing this special opportunity with us. We are pricing this Pouilly Fuissé Vergécosse 2016 at £22.99 per bottle, real value for such a premium wine as this. The President definitely knew his stuff when he got involved in this venture. Please email [email protected] to secure your piece of French delight. Merci Bob! When I worked at Bristol University, I took each year a group of students, staff and friends to a small village on the edge of the River Saone, overlooked by the Beaujolais hills. The stated purpose of the holiday was water-skiing, but there were plenty of other activities, including playing locals at boules and wine-tasting at surrounding vineyards. Over time, we got to know some wonderful vineyards and winemakers in both the Beaujolais and Maconnais. Many years on, the chance came to buy one of the vineyards, where wonderful Pouilly Fuisse is produced. A group of us purchased the property plus almost 2 hectares of Pouilly Fuisse vines and half a hectare of Macon Villages. The viticulteur, Roger Saumaize, has been attached to the vineyard for over 25 years. When we bought it from the family of the owner, who had died, we kept Roger on, still using the feudal mettayage system, whereby he receives a proportion of our wine rather than being paid. It has now worked well for over a decade, during which Roger was awarded Burgundy Winemaker of the Year by his peers. I am one of four directors of the company, which has two arms, the property and the vineyard. Pouilly Fuisse itself has become even more fashionable in recent times, as the wines of Southern Burgundy have become increasingly recognised. Ours has a wonderful balance of buttery notes and minerality, making it typical of the best products of the region. It is in a stunningly beautiful area, on the edge of the village Vergisson, nestled between the two dramatic hills, Solutre and Vergisson itself. We can also now offer bespoke gift boxes – perfect for the sporting wine fan! Select the bottle, or bottles, that would like to include and we can give you a price.